Monday, August 31 was the last night of the 2009 Pickin on the Patio season. I believe that this was the largest crowd we have ever had. From our modest start in 2003, the event gets bigger every year. The lion's share of the credit must go to our hostess, Theresa. She does an amazing job of keeping things moving and making everybody feel welcome. Her husband Bob, is a master musician who is wonderful at helping people find their key and knowing chord progressions to just about any song. Pickin on the Patio would not happen without them. Be sure and thank them for their hard work and dedication. 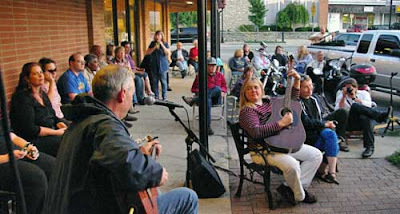 As far as we know now, the next Pickin on the Patio will be Monday, June 7, 2010. Keep the music going and we will see you next year. In the meantime patronize Homer's Coffee House, come hear Sky Blue whenever you can, and always support local live music.